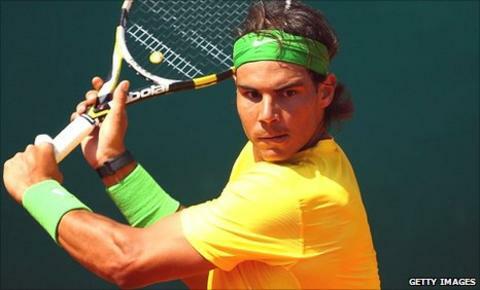 World number one Rafael Nadal began the defence of his Monte Carlo Masters crown with an emphatic second-round victory over Finland's Jarkko Nieminen. The Spaniard, who received a bye in the first round, won 6-2 6-2 in just over an hour. It was a powerful display of hitting from the 24-year-old, who cruised to the title here a year ago. Nadal next plays Frenchman Richard Gasquet, who beat Guillermo Garcia-Lopez of Spain 6-2 6-1 on Wednesday. He still tops the world rankings despite the fact that his last title win was the Japan Open in October. Since then he has lost to Roger Federer in the final of the ATP World Tour Finals, and suffered consecutive defeats by world number two Novak Djokovic in the recent Masters finals at the BNP Paribas Open and the Sony Ericsson Open. Last year, he came into the Monte Carlo Masters without a title win in 11 months but stormed to victory in the first clay-court tournament of the season without losing a set. There was never any danger of Nieminen upsetting him on Wednesday, the Finnish player failing to achieve even a break point. "Today was a positive start," said Nadal. "I think I played better than what I practiced the last days, so that's always positive. "I think I needed a few more days. [It] is just the first match. [It] is positive the way I played with the forehand and positive the way that my serve worked. It wasn't bad. I have to play a little bit more aggressive with the backhand." Nadal's record at the Monte Carlo event now stands at 35-1 and he was won 33 straight matches there since a third-round defeat by Guillermo Coria on his debut at the venue in 2003. His success there in 2010 - his sixth consecutive title - acted as the launch pad for victories at the Rome and Madrid Masters, before he clinched his fifth French Open, the Wimbledon crown and the US Open. He will be hoping to use this tournament to give him a similar boost this year, particularly as his number one status is under threat from Djokovic, although the Serb is missing Monte Carlo because of a knee injury. Also on Wednesday, fourth seed David Ferrer made it through to the third round after trouncing fellow Spaniard Feliciano Lopez 6-2 6-0. Ferrer used his powerful serve to superb effect, firing down three successive aces to take a 5-0 lead in the second set to knock the remaining fight out of his opponent. Also into round three is Austrian seventh seed Jurgen Melzer following his 3-6 6-1 6-2 win over Robin Haase of the Netherlands and eighth-seeded Frenchman Gael Monfils, who defeated Spain's Daniel Gimeno-Traver 7-5 6-2. They are joined by Spanish ninth seed Nicolas Almagro, who beat Argentine Maximo Gonzalez 6-7 (6-8) 7-5 7-6 (12-10), Serbian 11th seed Viktor Troicki, who registered a 6-3 4-6 6-4 victory over Italian Fabio Fognini, and Croatian 15th seed Marin Cilic, whose opponent Pere Riba of Spain retired because of a knee injury with the first set score at 5-2. However, sixth seed Fernando Verdasco was knocked out 6-4 6-3 by fellow Spaniard Tommy Robredo.